The spectacular Bird’s Nest stadium was the centrepiece of the most expensive Olympic Games in history. At £250million, the arena cost just a fraction of the £20billion spent on venues and infrastructure in the run-up to the Beijing Olympics. The huge spend in Beijing is more than double the budget for London 2012. The 91,000-seat stadium incorporates a gourmet restaurant with views of the athletics track, a four-star hotel with 80 rooms under one of its sides and a twin-level underground shopping centre. It was designed to be one of the most environmentally-friendly stadia in the world, as rainwater is collected and stored in underground cisterns for irrigation and to flush lavatories. Undersoil geothermal pipes help heat indoor parts of the stadium in winter. Nevertheless, the stadium has caused a deal of controversy. Some 6,000 homes were demolished to make way for it and there were claims that 10 people died in accidents during the four years it took to build, although the Chinese government confirmed only two deaths. 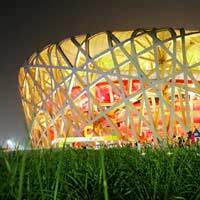 The flagship arena for the Beijing Olympics was designed by Swiss architects Herzog & de Meuron, who up until then were best known for designing the tyre-shaped Allianz Arena in Munich for the 2006 FIFA World Cup and for converting London’s Bankside power station into Tate Modern. The revolutionary design for the Bird’s Nest was chosen at the end of a six-month international competition. It is three times as heavy as the proposed London 2012 stadium due to an outer skeleton of 42,000 tons of steel. An inner double-layer of plastic filters out UVA light keeps out wind and rain. The Bird’s Nest stadium was designed to withstand a force eight magnitude earthquake and last for 100 years. It has been hailed as the finest arena in the world and architectural critics have said it sets standards of construction which may not be surpassed for decades. Even so, construction of the Bird’s Nest was halted after a terminal building at Charles de Gaulle airport in Paris collapsed. This was because the Beijing stadium shared some architectural elements with the terminal building, so the design was altered before construction recommenced. The iconic Bird’s Nest stadium was introduced to the world as 35,000 fireworks were launched from 1,800 sites around the city during the Beijing Olympics opening ceremony. What many people may not realise is that the stadium is full of hidden symbolism. In Chinese mythology, the sun is represented by a circle and the moon by a square, reflected by the shape of the Bird’s Nest and the nearby Water Cube, which hosted swimming and diving events at the Beijing Olympics. This symbolism was reinforced when the venues were lit at night – red for the Bird's Nest and blue for the Water Cube. The shapes also echo the Chinese symbols for male and female, and are built either side of the north-south axis road, which for three miles runs in a perfect straight line through Beijing, centred on the Forbidden City. The Bird’s Nest will always be remembered as the venue that hosted some of the most spectacular athletic performances in Olympic history. Star of the show was Jamaican sprinter Usain Bolt, who set three remarkable world records as he won the 100metres, 200metres and 4x100metres relay titles at the Beijing Olympics.